For the first time since Armenia's revolution, citizens have been to the ballot box. But Sunday's vote is less about the problems facing the country's capital, and more about the legitimacy of the revolutionary agenda. Nikol Pashinyan, Prime Minister of Armenia. (c) Gevorg Ghazaryan/Xinhua News Agency/PA Images. All rights reserved.When Nikol Pashinyan applied to run in the Yerevan city council elections in May 2017, nobody in Armenia could have predicted that he would be prime minister a year later — and that a few months later Yerevan would undergo snap elections for its city council. But while realities are conditioned by public perceptions, they still aren’t necessarily in agreement with them. Yerevan city council elections have become an important touchstone for Nikol Pashinyan’s revolutionary team. The “struggle for Yerevan” started on 16 May, a week after Pashinyan’s appointment as Prime Minister. That day, photos showing that trees had been felled in a park outside City Hall as part of a beautification project went viral. As a result, civic activists first occupied the park and then the municipality building as they demanded that Taron Margaryan, the mayor of Yerevan and member of former ruling Republican Party, resign. 2 May, Yerevan. CC BY-NC 2.0 Sona Manukyan / Flickr. Some rights reserved.This message seemed to be well-received by the protest groups in question. For a moment, decentralised protests faded away, including the demand for Taron Margaryan’s resignation. But by the time these appeals had stopped and the summer vacation mood arrived in Yerevan, on 9 July, Margaryan resigned. This is how the snap city council elections became part of the short-term political agenda. Armenia’s political forces, which had not yet recovered from the transformations in the spring, now had to reposition and decide on their participation. Revolution cancelled the vacation. The results of repositioning and rethinking participation among political forces showed the first outputs of revolution. Twelve political forces, including eight parties and four alliances, submitted the necessary documents to participate in the Yerevan City Council snap elections. This is unprecedented for local government elections in Armenia, which have never been a priority in Armenia’s national political agenda. Rather, they were a site of local struggle and local interests even during the tense political situation in the country. In Yerevan, the situation sometimes differed given the participation of the ruling party and/or most visible opposition forces, but not significantly. There’s a nuance to Yerevan city council elections that’s worth pointing out: if only three parties decide to participate, all three forces enter the city council. This was the case at the last elections, in May 2017, when only three groups campaigned for office: the (now ex-) ruling Republican party, Yelq (Way Out) Alliance which united Pashinyan’s Civil Contract party and two other parties - Bright Armenia (Lusavor Hayastan) and Republic (Hanrapetutytun), as well Yerkir Tsirani Party. Out of the three groups that ran in the 2017 elections, the Republican Party decided not to participate this year. They chose to retreat after losing executive power in the spring. Yerkir Tsirani, which took advantage of the fact that only three participants at the previous elections and became a faction in the city council, decided to run again. This time, Yelq Alliance is represented by two different blocs. One of them includes two allies of the Civil Contract Party in parliament — the Bright Armenia and Republic parties. The other one unites Pashinyan’s Civil Contract Party, Araqelutyun (Mission) party and some other groups, civic initiative members and simply active people under the name “My Step”. This group was led by the comedy actor Hayk Marutyan, who was been engaged in civic activism in recent years and also actively participated in the revolutionary process. Hayk Marutyan on the campaign trail. Source: Facebook. While Pashinyan’s party didn’t participate in the elections separately, its alliance does not include forces which are still considered allies in parliament. This time, the alliance, according to its declared rationale, positioned itself as being in step with the Armenian public. Indeed, the name of the alliance (My Step) recalls Pashinyan’s march across the country earlier this year, which became the start of the revolution. The name thus signifies continuity between the revolution and the city council elections. The alliance’s rationale, therefore, is an attempt to solve the issue that the author of revolution was not a single party: participating in elections as part of the Civil Contract party would probably raise questions on its inclusiveness towards revolutionary forces. Under this rationale, members of Armenian civil society participating in the My Step alliance represent not so much the revolutionary masses, but civil society itself. Indeed, this move symbolises civil society’s new “political responsibility” after they assisted Pashinyan, who was left without support by all political forces during the revolution in April-May. At the same time, the participation of civic groups indirectly suggests the possible reason for the absence of two other parties from Yelq alliance: the de facto non-participation of these parties in the revolutionary process. Other forces have also come to the arena: political parties represented in the Armenian parliament such as Prosperous Armenia and Armenian Revolutionary Party Dashnaktsutyun, which are also members of Pashinyan’s coalition government. Among participants are some forces that lost the opportunity to enter the National Assembly in 2017 such as the Heritage Party and Orinats Yerkir party. Others are newly formed or almost unknown to the wider public — the Reformists party, Yerevan Community Alliance, Hayq Party, Democratic Way Party, Yerevantsi Alliance. The range of candidates reveals how the space for politics — which enables political activity and makes it meaningful — has opened. Besides, the revolutionary authorities have received a good opportunity to implement one of the main tasks defined in the government’s new programme from 1 June: provision of truly participatory, free and publicly trusted elections. The fact that the vote was scheduled for 23 September inspired hope that, two days after celebrating Armenia’s 27th Independence Day on 21 September, Armenian citizens could count on the possibility of forming local authorities by their own free election in the list of achievements since independence. 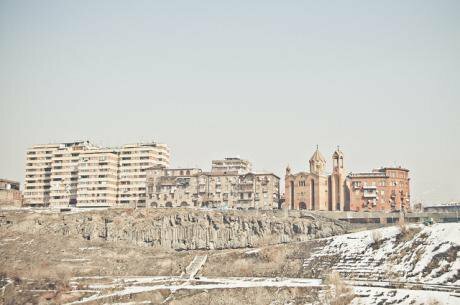 Despite the diversity of candidates, their articulation of the problems facing Yerevan as a city has been largely the same. The candidates have accepted that all of them more or less define the existing issues correctly. The differences, then, are in their proposed solutions. Yerevan is too big a city for Armenia, with its population of three million. More than a third of them live in Yerevan. All governmental and administrative agencies, institutions are centralised here. While looking at the economics, more than 60% of Armenia’s GDP, 74% of retail, 61% of construction, and 80.6% of services are produced in Yerevan. In other words, Armenia looks like a man whose head is far bigger than his body — and to find its balance, this man has remain upside down, causing disproportionate distribution of everything among the country’s other regions. Yerevan is currently preparing to celebrate its 2800th anniversary. At the same time, the evidence of ancient Yerevan and its traditions remain mostly invisible — and this is one of the main issues of the city. Civic initiative groups and organisations have raised the issue of systematic attacks on city architecture and environment in recent years, more often without visible results, but accumulating experience of resistance in this struggle. Public transportation is another important point in the city agenda. The former authorities were trying to reform this sphere, according to which fares for public transportation by bus or minibus were scheduled to increase from 100 to 150 dram. And in summer 2013, this provoked a huge civic response. Hayk Muratyan, who is now set to become mayor, was one of the celebrities actively engaged in that process. Indeed, that time civic activists and the city’s wider public won: the bus fares remained the same, but the issues remained. It was clear that public transport would be on the agenda for all 12 candidates. CC BY ND 2.0 Marco Fieber / Flickr. Some rights reserved. In general, Yerevan is not unique in its problems. According to the National League of Cities’s 2018 “State of the Cities” report, economic development, infrastructure, budgets, housing and public safety are the issues that worry most large cities. If you look at Yerevan in this context, you can see almost all of these issues here in a more or less localised way: economic development, infrastructure (waste management, transportation, parking, etc. ), budget (distribution of budget among city communities, the country government budgeting policy towards Yerevan), housing (including affordable housing and seismic resistance of buildings), also environment (air pollution, need for more green areas), healthcare and human services (lack of affordable and high-quality medical services, lack of adequate and sufficient kindergarten services). 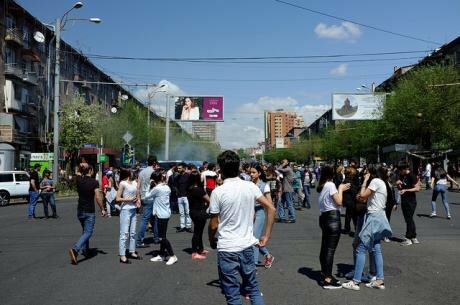 What differs in Yerevan, though, is a lower concern with public safety issues in comparison with other cities. Yerevan is a city where public safety and high level of crime are not in the list of high risks. At the same time, topics such as demographics, diversity and inclusiveness, as well technology and data (“smart city”) are quite new for Yerevan and were even included in the programmes of political parties. (Though they still sound too declarative and abstract to become real.) The political forces more or less mapped the issues and constructed their programmes following the logic of solving these problems separately. However, the reason that all 12 candidates put forward the same list of problems facing the city could be that these issues are on the surface, and have been previously defined. Instead what is missing here is a conceptual and political presentation of Yerevan as a complicated social system — one that has to be understood, described and redefined. This presentation should include the city’s relationships with Armenia’s other regions, the national government, tourists, business, its own inhabitants, local authorities, and so on. And what is most important: this conceptualisation should be based on the real social map of Yerevan, where the processes of gentrification and new urbanisation, social inclusion and exclusion are marked and politically defined. It seems that this “agenda saturation” pushed participants to find diverse solutions: one of the forces promised to open a direct flight from Yerevan to Los Angeles, (most likely to connect with the Armenian community in California); Yerevan inhabitants were also promised 70,000 new jobs as part of a plan to make the city a new Silicon Valley, turning Yerevan from desert to forest. To ensure participation of citizens in city governance, Pashinyan’s “My Step” block promised to open a separate office for referendums in the city municipality to ensure participation of citizens in city governance. This statement was made by Pashinyan on the heels of a leaked recording of a phone conversation between Armenian security officials. 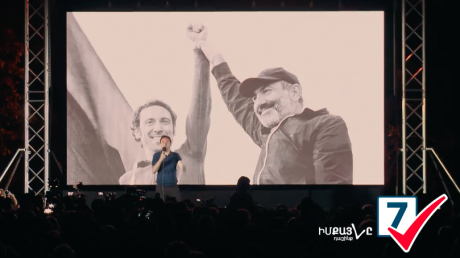 Pashinyan describes this event as a continuation in the battle between him and Robert Kocharyan, Armenia’s second president, which started in July 2018. Given Pashinyan’s high public legitimacy, his statement significantly changed the logic of the campaign. Candidates started identifying counter revolutionaries and showing their own devotion to the revolution, accusing others and offering excuses. Pashinyan continued be actively engaged in the campaign, using the pre-electoral platform almost every day to make declarations on the national political agenda, rather than the problems facing the city. Pashinyan’s further success depends how he will answer the question: who are the groups that Pashinyan doesn’t know in Armenian society? Thus, on different city squares, Pashinyan made appeals to the former authorities, oligarchs and their security personnel, the President of Azerbaijan, the security agencies, and so on. Pashinyan’s speeches were mostly combative, or if we consider it a speech made by the country’s highest official, even aggressive. The manner of Pashinyan’s speech provoked some declarations from other participants of the process in parliament on the possibility not to support Pashinyan’s initiative for dissolution of parliament with further extraordinary elections of the National Assembly. In turn, Pashinyan declared on 20 September that by doing so, those forces will go against the public. Moreover, he stated that the city council elections should be a mandate for him to call extraordinary elections to the National Assembly. The elections were, in effect, irrevocably transformed into a referendum on public trust in Pashinyan. These attempts to transform the elections into a referendum narrowed the political space which had been opened, ironically, mostly by Pashinyan’s previous efforts. But while the presence of Pashinyan does not cancel out the fact of holding city council elections with 12 participating forces, it should be noted that his strategy requires only two political subjects — himself and the public. No other political subjects are envisaged under this logic. From the one side, this strategy clears the political arena, but from the other it devastates it. Any other subject finds itself in a love triangle — where the third person is superfluous. Moreover, to bring sense to his own active participation and therefore replacing the city council agenda with the revolutionary agenda, Pashinyan targeted people in his speeches who weren’t candidates for the city council or even represented via any of the forces. 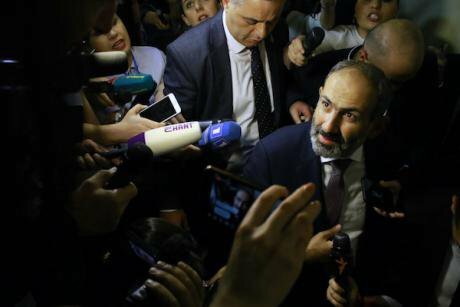 In this sense, the city council elections became impossible: voters could not elect the “light” and “dark” forces as described by Pashinyan per se, but could give their votes to the My Step bloc in approval of the April-May events. These kind of post-revolutionary elections are always approximate. Candidate debate on Armenian Public Television. Source: Facebook. In fact, the revolution happened, in part, due to the critically low level of public trust towards Armenia’s former authorities. Making trust the cornerstone for the relationship between government and society, Pashinyan expresses this trust only towards the public — via his own active engagement in the city council elections campaign. He thus showed his lack of trust towards his own team members participating in the elections and their ability to receive sufficient public support without him. Does Pashinyan understand that this strategy puts the achievement of one of the most important goals of his government — restoring elections as a mechanism for forming authorities — at risk? In this context, the opportunity for a real debate, which would inform the voters and assist them in making informed and meaningful decisions, was missed. 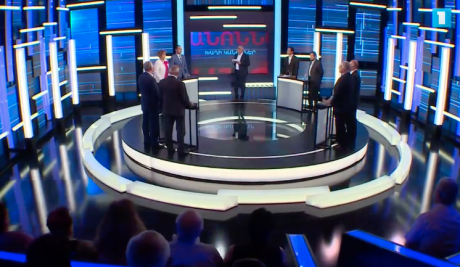 The candidate debate organised by Armenian Public Television on the last day of the campaign was broadcast right before midnight. It lasted only 50 minutes, and was supposed to give enough time for eight participants to present their programmes. Moreover, the debate was not broadcast live, but was pre-recorded. This is why four participants out of 12 refused to participate. Yerevan: where will the election results lead? According to the initial results announced by the Central Election Commission, Armenia’s revolution has won once again: roughly 81% of voters chose Pashinyan’s “My Step” bloc. Moreover, according to the results and electoral legislation, there is no need for the new mayor to be selected by the newly elected council: when a party receives more than 50% of votes, the party’s first choice becomes mayor. Two other forces entered the city council — Prosperous Armenia (7%) and Luys Alliance (5%). The latter did not pass the threshold for the alliance (8%) and will enter the council simply because the law states that at least three forces should be represented on the city council. Pashinyan’s strategy of declaring a “referendum” on revolution rather than elections per se has worked out, it seems. Looking more closely, however, at voter turnout (43.65%) poses new questions — questions that are more important than the expected second round victory of the revolution. If the revolutionary agenda proposed a mobilisation in Armenian civic life, why didn’t this happen five months later? Why did more than half of registered voters choose not to vote? Who are these people? Where were they in April-May 2018 and where will they be when the upcoming snap elections to parliament are announced? It seems that Pashinyan was already well aware who would vote for him in Yerevan: they were on the squares and streets during the revolution. Pashinyan’s further success depends how he will answer the question: who are the groups that Pashinyan doesn’t know in Armenian society? After all, calling these people “counter revolutionaries” may not be enough to secure victory the next time Armenia goes to the ballot box.